William Henry Goss bisque socket head doll, 24"
William Henry Goss & Company of Stoke-on-Trent, Staffordshire, England, also know as Falcon Pottery Works, is best known for their fine China, early dolls or figures made by Goss were Parian porcelain busts. Later Goss made bisque, usually shoulder head dolls, with bisque limbs in sizes to 36", bodies are usually made of fabric, sometimes of pink cambric stuffed with brown wool. 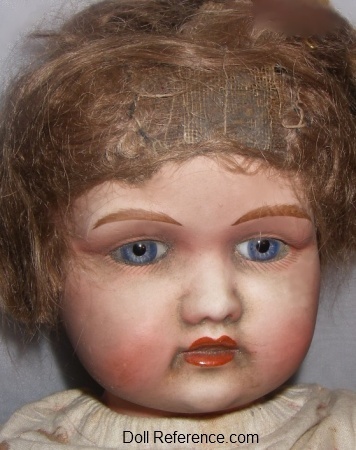 After WW I doll production ceased. Shoulder heads can be marked Goss, plus a mold number or a size. Goss bodies were assembled by Potteries Toy Company or British Toy Company and may have an oval shaped ink stamp. Goss dolls eyes can be stationary or movable, lips tend to be painted a deep red. The bisque shoulder head Goss doll on left, has stationary glass eyes, lightly feathered eyelashes, multi stroke eyebrows, wigged, deep red painted partially open mouth, blushed cheeks, white cloth stuffed body, doll marked Goss 32. Charming doll.